In 1943, Abraham Maslow introduced his hierarchy of needs in his paper A Theory of Motivation. According to his hierarchy, human beings are motivated by a number of different needs, but some are more basic than others. If those basic needs aren’t met first, then a person will not have the opportunity or drive to work towards ones higher up in the hierarchy. Fittingly, Maslow placed basic needs towards the base of the pyramid and less basic ones progressively higher up. Maslow argued that if an individual’s physiological needs were not met (e.g., health, thirst, hunger, etc. ), then higher order concerns such as being esteemed by others, being loved, or achieving a sense of belonging wouldn’t be a focus. He also argued that once a stage has been fulfilled that an individual will work on moving to the next one. 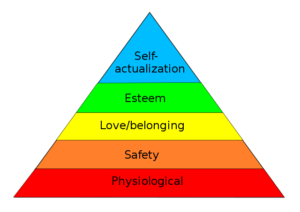 Critics of Maslow’s hierarchy have deemed the model overly simplistic, noting that it’s possible (and indeed quite likely) that a person may move back and forth between stages, fulfilling different needs or experiencing a desire to meet needs from multiple levels at one time. Furthermore, a person who has not yet nailed down the base of the pyramid can (and likely will) long to belong or be liked by others, even if their current circumstances make that desire harder to achieve. It is, after all, possible for a hungry person to fall in love. However, most sociologists accept other basic principles of Maslow’s theory, that some needs can be more existentially pressing than others and that if you’re struggling for your basic survival, you’re unlikely to be able to focus on becoming self-actualized. Even if all these needs are satisfied, we may still often (if not always) expect that a new discontent and restlessness will soon develop, unless the individual is doing what…[they are] fitted for. For an artist, self-actualization might be about creating art and exploring that side of themselves. However, self-actualization isn’t just a need for those with a creative orientation. Self-actualization can for others be about reaching your social potential (politicians, activists, etc.) or intellectual potential (academics, scientists, etc.). As with other needs, climbing towards self-actualization is an active, rather than automatic process. You could be a person who had your physiological needs met, who was generally safe, had found a place to belong, and was esteemed by others and still not easily become self-actualized. Looking to figure this out, they would go on to study self-actualized people to see what seemed to set them apart from those who had met all of the more basic needs but hadn’t gotten there. Self-actualized people have peak experiences, times in which the present moment will overwhelm them with joy, happiness, and fulfillment. They easily experience flow state. Sometimes people refer to this as “being in the zone.” It’s basically when you become so absorbed in an activity that you lose conscious awareness of yourself and can even lose complete track of time. They are accepting of themselves and others. They view all other people as individuals who are deserving of rights, even members of outgroups. They are realistic. They acknowledge the problems that actually exist and any difficult situations that might be before them. They’re problem-centered. They focus not on complaining about the existence of obstacles but instead direct their efforts to working toward effecting positive change. And they do this with a strong sense of personal ethics and responsibility. They enjoy privacy and solitude. Typically, they do have a core group of close friends, but when it comes to the company they keep, they tend to prize quality of connection over quantity of connection. They also highly value time alone with their own thoughts. They employ a non-hostile sense of humor. When they laugh, they laugh at themselves and situations, not at other people. And they use humor to incite joy in themselves and others — not to cause humiliation or harm. They enjoy journeys and not just arriving at destinations. They tend to derive a lot of joy from experiencing a process and not just results. Barnum Effect, Or Will I Ever Find My Ramen Patronus?